Having defined and implemented its new health and wellbeing strategy Crossrail wanted to evaluate its impact. To this end it commissioned the “Have Your Say” wellbeing survey. The surveys were to be used to inform and steer the implementation of the Wellbeing programme and see if the strategy was having a positive effect. This report outlines the findings for two consecutive years of the survey and compares the results. The impact is discussed and the lessons identified. The report will be of use to any organisation looking to set up or develop an organisation wide wellbeing survey. 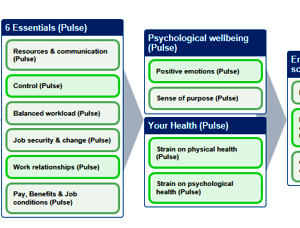 In August 2015, Crossrail defined the wellbeing commitments of its Occupational Health and Wellbeing Strategy. With the overall aim being for Crossrail to keep its people healthy and safe, every day at work, the strategy is made up of “Four Cornerstones for Health”. Wellbeing is one of the four main elements. At the same time, Crossrail embarked on the first of two wellbeing surveys. The intention of these surveys was to inform the Wellbeing Programme which would be developed to implement the strategy and to measure the impact that the programme was having. The survey was called “Have Your Say”. Robertson Cooper’s validated ASSET survey of workplace pressures, resilience and wellbeing was used as the core of the survey. Additional, Crossrail-specific, questions were also included. All Crossrail workers were invited to complete the surveys (whether they were directly employed by Crossrail, a contractor or sub-contractor). The survey was available online, but paper copies in multiple languages were also issued to all sites, to maximise the accessibility of the survey to all. In 2015, 4,149 people took part in the survey; which represented 30% of the workforce at the time. The overall results were positive. In all areas people reported to feeling as or more positive than the comparison group (a General Working Population norm group). People reported to feel favourably towards all areas of workplace pressure, especially the level of Control in their roles and their Work relationships (these areas were more positive than is typical of the comparison group – as indicated by the brighter green colour). The impact of work on health and wellbeing was also mostly more positive than for the comparison group (with the exception of Sense of Purpose which was typical of the comparison group). Interestingly though, these results felt surprising to the stakeholders they were presented to. It was felt that the results were a positive skewed representation of how things really felt at Crossrail. Given the low response rate of just under a third of the workforce, it was therefore decided that the results needed to be treated with caution. The result could have been a result of people feeling compelled for some reason to portray a more positive perception of their workplace (although the survey is anonymous, so fear of criticising the organisation should be limited by that). Or, it may have been the result of a small sample; perhaps the 30% who completed it were the more engaged and happy workers. The less positive ones may have not been motivated to take the time to complete the survey – perhaps feeling too under pressure to take the time out to do it, or not thinking it was an important enough subject to invest time in. The impact of the response rate limited confidence in the result and is discussed in the lessons learned section. By 2016, as a result of many projects having reached completion, the organisation was much smaller. The number of respondent was lower, at 2,797, but this represented 44% of the total workforce at the time. Overall the results were broadly similar to those of 2015. However, with the higher response rate and compared to anecdotal evidence, this felt more reflective of the actual experience of working for Crossrail. There were a few areas of difference between the two surveys. The most notable improvement (in addition to the improved response rate), was the increase in Resilience rating; showing that people felt more positive in 2016 than 2015 about their capacity to cope with their work pressures. There were two areas which showed an apparent decline since 2015. These were Work Relationships (moving from more positive than average to typical for the comparison group) and Commitment of Employee to Organisation (moving from typical of comparison group to slightly lower than comparison group). These findings were not unsurprising though, given the organisational context. The completion and near completion of many projects had meant the disruption of teams and reduced longevity of existing jobs. It was therefore understandable to see this reflected in how people felt about their relationships with colleagues and their commitment to the organisation. Nevertheless, these were areas which were considered as opportunities for improvement. The findings were shared with project leaders and wellbeing champions to identify opportunities to improve these areas, despite the disruptive end-of-project context. The repeat of the survey was intended to measure the impact of the Crossrail Wellbeing Programme. The direct impact of the programme is confounded somewhat in the results by other influences on wellbeing, such as the insecurity created by many of the projects nearing completion or the additional pressure created by projects being behind schedule or over budget. That said, a number of inferences can be made from the survey findings which provide insight into the impact of the programme. The increase in response rate. The response rate increased between surveys from 30% to 44% of the total workforce. The communication and administration of the two surveys was conducted in a very similar manner and so the increased response rate is likely to have been the result of people being more aware of the importance of wellbeing and also more trusting in sharing their thoughts about pressure and wellbeing. As promoting Crossrail’s commitment to wellbeing and raising awareness about the subject were key objectives of the wellbeing programme, this result was taken as an indication of progress. Resilience ratings (based on people’s perceptions of their capacity to cope with workplace pressure) increased from 67% in 2015 to 81% in 2016. Although the anonymity of the survey means it is impossible to directly attribute this to the resilience trainings offered to people, it is a good reflection of the success of the programme’s efforts to build people’s capacity to create good days at work for themselves. Over two thirds (77%) of the workforce believe that Crossrail is committed to the wellbeing of its people. This question was only asked in 2016, so any change over time cannot be established, but this is a strong majority and infers that the Wellbeing Programme is widely visible and effective in promoting Crossrail’s commitment to wellbeing. In 2016, people were asked who they were employed by (Crossrail, a contractor or sub-contractor). A general trend was found that positivity declined as people were more distantly associated with Crossrail as an employer (i.e. the results from Crossrail employees were the most positive and sub-contractors were the least positive). This finding reinforced concerns that the wellbeing lead had reported that it had been harder to engage contractors than employees in wellbeing activities. This was a challenge raised by wellbeing champions and the results seem to reflect the fact that Crossrail’s commitment to wellbeing make it a more positive experience to be employed directly than by a contractor or subcontractors (who may have competing priorities and not be as fully engaged by the wellbeing strategy). The first lesson learned, occurred as a result of the low response rate of the first survey. The impact of the low response rate (which was coupled with a high rate of “no response” to particular questions) meant that the result profile did not feel representative of the true experience of working for Crossrail (based on the experience of stakeholders and the anecdotal feedback they were aware of). Because of this, the results had to be used with extreme caution to inform the subsequent wellbeing plan. This results profile could easily have undermined the business case for investing in wellbeing; as from the survey results on face value it looked like wellbeing was already very good. This is therefore an issue which should be considered by other organisations and future projects before embarking on a survey. It is important that the people are sufficiently engaged in the subject before the survey is conducted, in order to achieve a representative response rate and receive honest responses to get an accurate reflection of the employment experience. The second major lesson learned was in the use of a survey to measure change over time. The impact of context changes can have as great an impact on results as any interventions deliberately aimed at influencing results. Survey repeat is an acceptable method of measuring change over time. However, the limitations of this need to be taken into account and the results interpreted with consideration for changes in the context in which people completed the survey. It could have been highly disheartening to those involved in having driven the wellbeing programme to have presented the finding of reduced employee commitment to them as an implied “failure” of the programme, rather than as the more likely reflection of the short-term duration of the remaining projects. The recommendation is that surveys are used as a very useful indicator of people’s perceptions, but that findings should never be interpreted in isolation, and always with consideration for wider context.